WHY ARE THE PEOPLE GOING TO CHURCH? Some parishes are blessed to have priests who are magnanimous speakers; the people love them dearly as they bring joy to their parishioner’s hearts. While other parishes possess angelic music which excites the soul; Sunday masses are booming at those parishes. Yet, for some of these parishes, even though they may have all the “bells and whistles” which satisfies people’s sensations, daily mass is barren and the sacrament of reconciliation is almost non-existent. 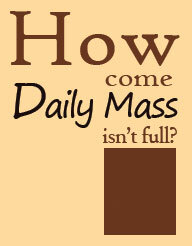 The people are “happy” when they leave Mass on Sunday, but that’s the end of their faith experience. Why? Are the people only going to Mass for the priest or the music, and not to live out their faith? Have they forgotten Jesus’ most amazing gift to them in the Holy Eucharist and His incredible mercy and forgiveness through the sacraments? Sadly, much of the time, this is true. Many people have forgotten why they are Catholic and why they should be going to Mass in the first place.The reasons why everyone should attend Mass is to praise Jesus and receive His Body, Blood, Soul and Divinity in the Most Blessed Sacrament, while hoping for the gift of eternal life which is delivered through the graces of the sacraments, by the merits of Our Lord Jesus Christ. This must be emphasized daily since Satan is succeeding at convincing the faithful that their worldly activities are of greater importance, and the “feel good now” approach to life should be our goal in order to obtain a life of joy. 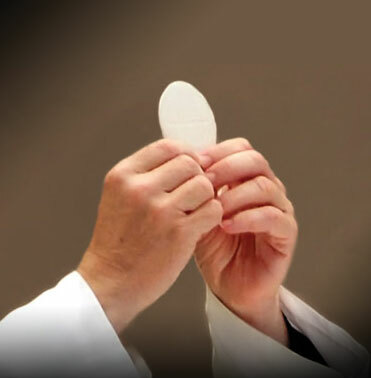 Jesus’ graces are available to many people everyday in participating in the Holy Mass and in the Holy Eucharist, lets guide the people to run to our Lord, in the Mass, and to receive our Daily Bread, if they are in the state of grace, for the help they need in their day. Pastors have a constant battle with trying to keep the people attending Mass. Their struggle is real and challenging since the Devil is so effective in persuading people away from the true faith, but if the battle to keep the parishioners in church is won outside of the “right” priorities then all will be lost as the parishioners won’t have a true lasting faith; a faith that will save their souls. If someone shows up at Mass and doesn’t pray, but leaves “feeling good” through uplifting homilies or beautiful music, then goes about their daily life living in great distress and sin, what is gained? Have we lived our call of bringing people to the faith that saves? No. Our main goal shouldn’t be keeping people in the Church through their worldly senses. Of course, wonderful homilies and music are good things, but they work to benefit the parishioners if the people are trying and learning to really love Jesus during the Mass, in the Eucharist, and working hard to sin no more through delighting in the sacrament of reconciliation. Our senses can enhance our spiritual experience and bring us even greater joy during the Mass if faith has already been established.There’s nothing wrong with an uplifting homily if there are also homilies that tell of the hard truth of sin as well as mercy and salvation. There’s nothing wrong with wonderful music. Worship should include beautiful music, but if it is the driving reason people are attending Mass on Sunday—and the love of Christ in the Blessed Sacrament, praising God during the Mass, and rejoicing with living His commandments isn’t there—then what has been gained? Where is salvation? If we (the people and priests) focus daily on encouraging change–removal of sin, love of the Eucharist and frequent reconciliation, the people will begin to really love of God and seek out salvation as their goals. Then we will be living our call to save people through our preaching and teaching. We are scourging our Lord through His Sacred Heart of Love and damaging people’s souls by not doing everything we can to encourage others to change and work daily to love God by not offending Him by our sins. If the people develop a love for Jesus in the sacraments and a desire to live His Word, they will want to stay in the Church as a result of their growth in holiness. Remember, we aren’t saving anyone’s soul by simply keeping them in church—they need to be reconciled with God; they must learn how to love God–to sin no more. It’s better to have a church half-full with faithful people, then full with people who are spiritually dead. Our focus should be on bringing people to holiness.